The number of earthquakes striking south-central Kansas has skyrocketed. This map shows the 2,522 earthquakes that occurred from May 2015 to July 2017 in all of Sumner County, small segments of Sedgwick County to the north and a portion of Harper County to the west. During this period, Sumner County alone experienced about 2,400 earthquakes, ranging from 0.4 to 3.6 magnitude. A 3.0 magnitude earthquake is usually felt by humans. 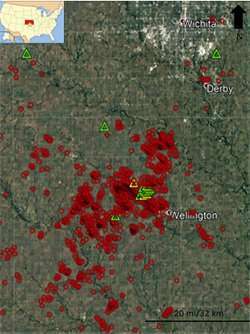 Red circles indicate earthquakes. Triangles indicate sensors the geologists used to study the earthquakes. Citation: K.A. Nolte, G.P. Tsoflias, T.S. Bidgoli, W.L. Watney, Shear-wave anisotropy reveals pore fluid pressure-induced seismicity in the U.S. midcontinent. Credit: Sci. Adv. 3, e1700443 (2017). As concern rises about earthquakes induced by human activity like oil exploration, geologists at the University of Kansas report a new understanding about recent earthquakes in Kansas and Oklahoma. This breakthrough may one day lead to a method for predicting where induced earthquakes might occur and may help the energy industry and regulators decide where they can safely place wells. In a paper published online today in Science Advances, K. Alex Nolte, doctoral student in the Department of Geology; George Tsoflias, associate professor of the department; Tandis Bidgoli, assistant scientist at the Kansas Geological Survey, and Lynn Watney, senior scientific fellow at KGS, report they were able to use an array of sensors in the Wellington oil field in south-central Kansas to detect signals of local earthquakes that point to an increase in fluid pressure in particular areas of the subsurface. The ability to directly detect earthquake-causing pressure may enable geologists to develop methods of predicting which areas of the subsurface might be prone to induced earthquakes. "It's very promising, but we haven't solved anything yet," Nolte said. "There are still a lot of hurdles to cross." The published paper provides new insights, but it is also unusual because its lead author, Nolte, is still a student. Few scientists, let alone students, ever publish in one of the prestigious journals like Science Advances that are produced by the American Association for the Advancement of Science. The publication is Nolte's first, and it deals with a problem affecting his hometown of Wichita. The study was prompted by a startling increase in earthquakes in what had previously been the seismically quiet midcontinent. In the more than three decades between 1977 and 2012, only 15 earthquakes with a magnitude of 3.0 or greater were recorded in the entire state of Kansas. A magnitude 3.0 earthquake is typically felt by humans. Since 2012 more than 100 earthquakes of 3.0 or greater have been recorded in only two counties in the state, Sumner and Harper. These include the largest earthquake ever monitored in Kansas in November 2014, a magnitude 4.9 event near the Sumner County town of Milan. The frequency of earthquakes has continued to increase. Between May 2015 and July 2017 the KU array of sensors detected more than 2,400 earthquakes in Sumner County alone, ranging in magnitude from 0.4 to 3.6. A number of researchers have already linked the increasing occurrence of earthquakes in the area with human activity, specifically an oil boom that has produced ever increasing amounts of wastewater. Every oil well produces wastewater. This is true of conventional wells and of wells that employ hydraulic fracturing (known popularly as fracking). The oil boom led to more oil wells being drilled in the area, which led to a sharp increase in the volume of wastewater. Researchers now believe the increased injection of wastewater into the salty aquifer in the subsurface, the Arbuckle, caused the increase in earthquakes. Because conditions in the subsurface vary and a perfect storm of problems must be present for a wastewater injection well to induce an earthquake, only a relatively small fraction of injection wells cause tremors. This makes it difficult for regulators and the energy industry to determine where they can place wells. Like sponges made of rock, aquifers store fluid in their pores. Injected wastewater increases the pressure of fluid in the aquifer's pores and in fractures (cracks) in the rock. An earthquake is triggered when the fluid pushing against the rock affects an existing fault that is already close to slipping. If researchers can detect regions of elevated fluid pressure in the aquifer's pores, they might be able to predict where induced earthquakes would likely occur. The geologists tracked the increase in pore pressure by noticing a difference in the way seismic waves from recent earthquakes, presumably injection-induced, act compared with the way waves from older, naturally occurring earthquakes act. The group studied what geologists call shear-waves, or S-waves, looking closely at their anisotropy, a phenomenon where waves split in two with one component of the wave traveling along the fractures in the rock and the second component traveling perpendicular or nearly perpendicular to the orientation of the fracture. In the naturally occurring earthquakes that do not involve high pressure, the wave component traveling along the fractures moves faster than the wave component moving perpendicularly to the fractures. In the induced earthquakes in Kansas, the geologists found the opposite. "Such changes, or 'flips', in fast S-wave orientation had been previously documented in natural earthquakes and volcanic settings where there exist zones critically stressed by pore fluid pressure," Tsoflias said. "Our observation of S-wave flips in recent southern Kansas earthquakes provides for the first time evidence of increasing pore pressure in the region from seismological data." so far the industry has NOT placed wells UN-safely. government has little role beyond unwarranted interference. The geologists should look back to the time that the Rocky Mountain Arsenal when it was challenged by the destruction of nerve agents. After the destruction the results was to be pumped down deep in the mountain. As the pumping started the number of earthquakes started increasing. As the duration of pumping and the volume pumped increased and the number and the intensity of the quakes increased. It was suspected that the fluids pumped into the mountain was the cause so the pumping was stopped and the quakes decreased in intensity and in frequency. Check it out. They're causing earthquakes, you consider that safe well placement? Hate to see your definition of what an unsafe well might consist of. Government's responsibility is the safety and benefit of the citizens of which it is composed. Corporations, not being citizens, have no inherent legal rights that would trump the rights of the citizens to safety and security. If people think for some unfathomable reason that earthquakes are not beneficial to their health and security then the government has every right to put a stop to the cause. I recommend you go back to high school and take a Civics class, if they still offer those. I wonder if fine-tuning how to predict fracking-related earthquakes is really the most urgent problem about fracking. We know (now) that geologists did not know that 'produced water' as well as pressurized hydraulic fracking would cause earthquakes. But is even earthquakes the main problem. It seems to me that preventing water pollution from the fracking process is much more important. Scientists (in my view) should be spending their time on saving our good water – if fracking CAN be done without water pollution then go on an fine tune earth quake predicting etc. But until our WATER is safe from fracking all the scientific activity is without meaningful purpose.